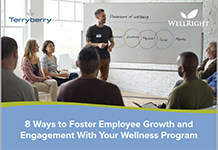 Terryberry can help your organization implement an Employee Wellness Program that encourages healthy behaviors and rewards employees for taking steps to be well. An effective corporate wellness incentives program is a good way for employers to reduce healthcare costs and increase productivity, plus improve engagement and overall well-being. Your customizable employee wellness platform from Terryberry can be up and running sooner than you may think. 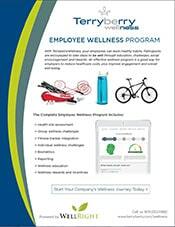 We offer a selection of employee wellness program packages that are flexible to meet your organization’s employee wellness needs. Our programs make employees aware of and educated about health risks and how they can affect the body, the mind and the workplace. The Terryberry Wellness program includes fun and motivating challenges for employees at all stages of their health journey. The challenges encourage next steps and healthy habits. Our wellness rewards options will aid in motivating employees to take positive action to improve and maintain their good health. We will provide tracking solutions and tools to help you advocate good health in your workplace environment. As participants progress through their wellness journey, they’ll earn points for healthy behaviors. Wellness Points can be redeemed through the Terryberry program for wellness incentives, like brand-name rewards or a variety of health-conscious gifts. Help employees cut calories with food steamers and grills. Encourage them to stay hydrated with cool water bottles. Get them moving with badminton sets, fishing poles and hiking gear. And help them keep tabs on their physical activities with Garmin fitness watches. These employee recognition awards are perfect for a variety of businesses and healthcare organizations. What are Important Benefits of Employee & Corporate Wellness Programs? Employee wellness programs have an average 150% return on investment, according to a study by Rand Corporation. Wellness Programs can create a less stressful environment which can, in turn, lead to higher levels of employee happiness. They can help prevent and reduce illness which can be harmful to your employees and a hindrance to productivity. Reducing health care costs and the strain that is placed on organizations when employees miss work due to illness are obvious reasons that investing in employee wellness is important. In addition to physical well-being, emotional and mental wellness are also important elements of a healthy workforce. A good employee wellness program considers the whole person and encourages individuals to take their next steps toward becoming their best selves. When employees are feeling well physically, emotionally and mentally, they are more focused, energetic and ready to give their best effort each day. An employee wellness program is a program that is applied by a company with the aim of improving the health of its employees or labor force. With the Terryberry Wellness platform, you’ll encourage healthy behaviors and reward employees for taking steps to be well. Contact us today and become one of our 25,000+ clients worldwide!